Madeline- "They left the house at half past nine/ In two straight lines in rain or shine- /The smallest one was Madeline.” Nearly everyone will find, if they try, that they are able to recite these first few lines of the Madeline books. 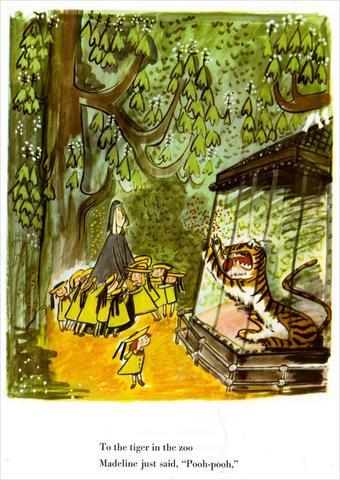 What makes Madeline so remarkable though isn't her enduring popularity, but that even though she is the smallest, she is still the bravest, saying "pooh pooh" to tigers at the zoo. She is kind, taking in stray dogs and stopping bullies, and a perfect example of what we want as a role model for girls and boys alike. Oz books - Some people are surprised that that is more than one book about the magical land of Oz, but let me tell you something even more better- all the rest are far, far superior to the first. Part of that is the role that girls and women play in all of the books. L. Frank Baum was himself a suffragist, and purposely made his protagonists girls. Strong, and powerful women were sources of wisdom in his stories; girl rulers were nobel and kind; Dorothy- and other heroine's modeled after her- were plucky and had common sense. In one book even, two armies faced off and all the members of either side were girls! He did this because he felt it was important for women to be represented in literature, and tried to do just that when creating his "American Fairytales." The Betsy-Tacy series - Another series that deserves far greater recognition than it gets, these books show the daily life of a two girls living in the early 1900s. Though technically fiction, the author, Maud Hart Lovelace, draws quite heavily from her own life to the point where it might be more accurate to say they are fictionalized memoirs. The first book starts when Betsy is five and future novels take her through childhood, high school, and eventually college, marriage and the world beyond. As she ages, the writing becomes more complex, allowing the reader to grow with the series. What I love most about these books is that all the women are individuals (since they are based on real people that is hardly surprising) with complex inner lives, and nearly all of them pursue jobs and dreams outside of the home, with the support of their families. Eight Cousins and A Rose in Bloom- Louisa May Alcott's Little Women and its sequels are perhaps better known, but I love these two books. In real life Alcott was a feminist; she and her family had been part of the transcendentalist movement. Both of these facts put her in the same social circles as the likes of Ralph Waldo Emerson and Henry David Thoreau. The characters in the books likewise espouse many of the same values and even quote some of her friends' works. Yet, it never comes across as preachy. Instead, Rose, other female characters, and the male characters are equally encouraged to make something of themselves, to have a purpose beyond that of leisure and family. Again, these are messages that I find very encouraging to young readers. Emily of New Moon- The whole world love's Lucy Maud Montgomery creation, Anne of Green Gables. This book series is somewhat in the same vein, but here Montgomery draws more closely from her own childhood and young adult experiences as she chronicles the daily life of Emily. Like Montgomery did, Emily longs to be an author, a dream that sometimes put her at odds with society's expectations of women. Emily also deals with deep emotions as she and her friends struggle to find their right paths, a theme that I feel will resonate with readers. All good! Everyone needs to know there are more Oz books.